Glenn Fessler grew up in Madras and leased the Monroe Ranch in Grizzly in 1992. 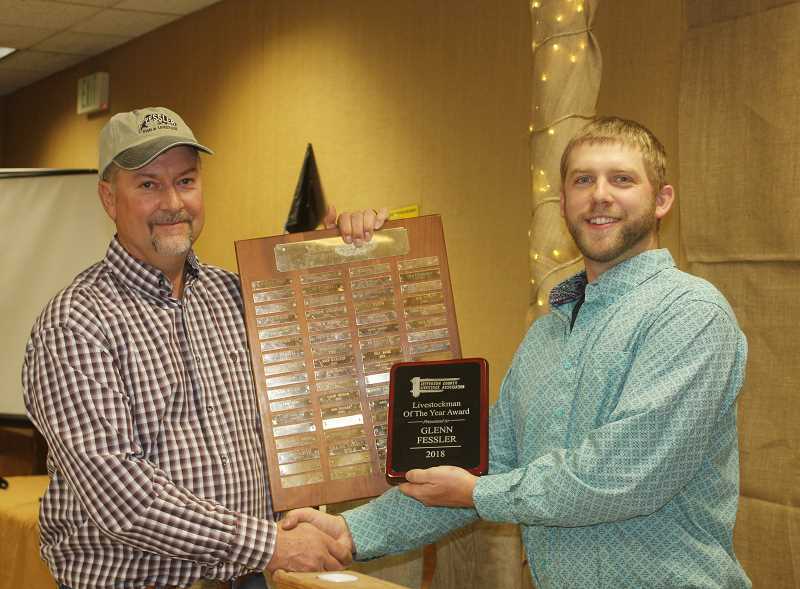 The Jefferson County Livestock Association named its Livestockman of the Year on Saturday, along with presenting several other awards, at its annual banquet at the Jefferson County Fairgrounds. Glenn Fessler was named Livestockman of the Year. Fessler has a long history in the community, Livestock Association president Mark Wunsch said, including that Fessler moved to Madras when he was 8 years old. "His parents bought a farm in 1977 and the love of farming and ranching captured his interest," Wunsch said when introducing Fessler. Growing up, Fessler spent time working for his family on the farm, and participated in 4-H.
Getting started with a herd of cattle proved a struggle in the beginning for Fessler. He received a cow from his father when he was 10 years old, but the cow didn't make it. At 11, he received another, but again, same story. The third cow, when he was 12, finally produced a calf that ended up dying and it wasn't until Fessler was 13 that he had a cow and a healthy calf to move forward with. Fessler purchased his first 250 head marginal permit in 1990, going on to lease the Monroe ranch in Grizzly in 1992. In 2004, Fessler purchased the ranch and today, Fessler farms about 650 acres of hay crops, for himself and other people combined, and calves around 50 head of heifers each year. Fessler also serves on the board of the Gray Butte Grazing Association. He and his wife, Jeannie, married in 2000, have six children ranging in age from 8 to 25, and the Fesslers are expecting the arrival of their first grandchild in February. Central Oregon Seeds received a special recognition award from the association this year, presented to managing partner Mike Weber, who along with several other individuals started the company in 1979. The award is given out each year to a business, individual or organization that contributes to the livestock industry in one way or another. The idea is to bring recognition to individuals or groups that work behind the scenes to support the industry in varying ways. Before presenting the award, Wunsch mentioned that Central Oregon Seed has purchased more than 150 animals over the years from the Jefferson County Fair, promoted other local businesses and been involved of many other aspects in the community, aside from agriculture. Taylor Olson, a freshman at Madras High School, was awarded with the Supreme Beef Award, and Hailey Bare, an eighth-grader at Jefferson County Middle School, received runner-up. The award is given out each year to participants in the Jefferson County Fair, based on carcass quality, and interview and several other criteria. Following the awards, the association held a live auction, with everything from gift baskets and cupcakes to a set of tires and a safe. Traditionally, proceeds from the auction have gone solely to the association's scholarship fund, but this year, part of the money raised will go to Perfect Balance USA, a local nonprofit that aims to educate people on where their food comes from.